Without Spot or Blemish | "Northern Crossings"
We tend to telescope events of the Passion of Jesus from Palm Sunday through the Maundy Thursday and Good Friday and Easter. There are amazing things that take place all through Holy Week beginning on Palm Sunday and most of them occur in the temple. Some time after Jesus comes in on the colt of a donkey He approached the temple and sees a fig tree that had no fruit and cursed it and withered it. Prefigured judgment, some have called it, enacted judgement some have called it, but what ever it was it was not the execution of judgment. As Martin Franzmann has said in his book, “Follow Me” Jesus did not blast men or the temple; He withers a fig tree. God’s people have made the temple worship a falsehood and turned the House of God into a den of robbers. The people are rejecting the Messiah and all their worship is empty and the symbol is there for all to see. A withered tree. I had a book that I have lost that was written by a Jewish scholar who converted to Christianity after reading the Gospels. He said something fascinating about this sequence of events from Palm Sunday through Good Friday and that centered on the motif of Jesus as THE Lamb of God. He returned to the Old Testament institution of the Passover as to how the Passover lamb was chosen and examined. People chose their lamb and examined it for four days. People had to make sure that it was without spot or blemish. That carried through to the Lamb in the temple that was examined in the temple precincts before the Passover slaughter. His point was that Jesus, the Lamb of God that takes away the sin of the world was being examined on these days before His slaughter. He is questioned by Jewish leaders, Pilate and even Herod, and found to be faultless. He is examined by spies and found to guiltless. He is even examined by Judas who confesses He betrayed innocent blood. 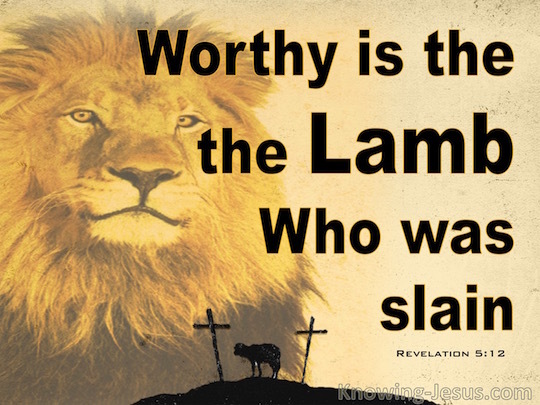 He was found to be spotless and blemish free and still murdered, “for us and our salvation”. God’s sacrificial offering for man’s sin chosen before the foundation of the world (1Peter 1:20) was celebrated for centuries by Israel in the Passover, and found its ultimate fulfillment on a Roman Cross at a place called Golgotha. Politics and Harmony and Mercy.